We all love to laugh, but there’s far more to a good giggle than simply providing a high. An innate ability, laughter developed even before we could say dada or mama. Here are five reasons we all need to get laughing. This optimises healthy body and brain functioning, improving concentration and productivity levels. Prolonged laughter helps rid the body of residual air replacing it with energy rich oxygen. It’s one of the most fun aerobic activities ever! When you laugh, the number of immune cells and infection-fighting antibodies that improves your resistance to disease increases. Some research has even shown that mirthful laughter may increase natural killer cell levels, a type of white blood cell that attacks cancer cells. A hearty laugh reduces stress hormones resulting in lower tension, stress, anxiety and fear. It also triggers the release of endorphins (happy hormones) making you more relaxed physically and emotionally. It can even lower your blood pressure. Laughter helps shift difficult emotions, freeing the body and mind of stress. No matter your age, laughter is a super-bonder. It’s very hard for two people who laugh together to feel any animosity towards each other. Laughter even makes you more attractive and, like a magnet, people are drawn to other people laughing. The great news for relationships is that couples who laugh together tend to stay together. Laughter activates the body’s natural relaxation response and brings you into the present moment. It’s a whole brain experience, stimulating gamma waves in both hemispheres of the brain enabling you to think and focus more clearly. Regular laughter and smiling helps rewire the brain to create joy-filled neural pathways. Ros Ben-Moshe is a laughter therapist and founder of Laugh Life wellbeing programs. She has empowered thousands of people to connect to their own mindfulness, and to become aware that even in the darkest times there is always light. 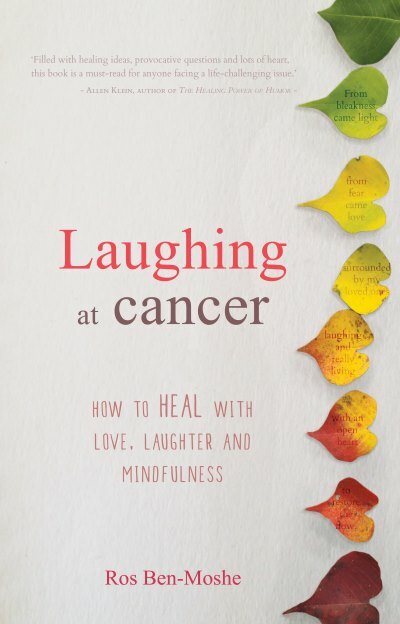 The cancer-survivor, and mum-of-two, is also the author of Laughing at cancer: How to heal with Love, laughter and mindfulness. To find out more visit laughingatcancer.com. Copyright © 2019 Laughlife. All rights reserved.